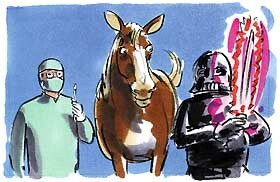 Horse Surgery, a kinder cut with laser surgery. Compared to “sharp” surgery done with the conventional instruments, lasers have many advantages since they can cut and cauterize at the same time without damaging nearby healthy tissue. There is less swelling and sensitivity including less bleeding since the capillaries and small nerve endings are sealed. However, conventional methods still work best for many procedures. Although the more lasers are used in the medical industry the more uses doctors find for them. For a horse lasers are found to be an excellent option since they are less of an ordeal. Laser is actually an acronym that stands for Light Amplification by Stimulated Emission of Radiation and is actually a description for a way of concentrating light and generating light on different wavelengths. For horses there are two types of surgical lasers that are used: CO2 and Nd:YAG which stands for neodymium: yttrium argon garnet. The CO2 laser is used for all procedures that are non-contact, which means only intense light touches the tissue. The incision is made by focused light. The surgeon is able to evaporate the tissue or coagulate blood by defocusing the light and varying the distance. A flexible fiber is used to get the best function of a Nd:YAG laser and it allows surgeons to reach previously inaccessible places. The laser can also be either contact or non-contact. This means this laser has the advantage of reaching tumor cells that have not been cut away. Superficial tumors of the cornea or the clear portion of the eye can be removed by CO2 lasers but they will not penetrate beyond that depth. The Nd:YAG laser has the ability to pass through the cornea with no effect on the eye and perform surgery on the iris and retina or the pigmented portion of the eye without the need for a corneal incision. The CO2 laser can be used in serious sinus surgeries that require an incision and often bleed dangerously by working around the area to reduce the amount of bleeding. Without the CO2 laser the surgeons are in a race to complete the surgery since packing the wound is the only way to stop the bleeding and once the wound in packed they cannot perform surgery anymore. The CO2 laser helps surgeons eliminate this problem. When lasers are used for castration the advantages over sharp surgery become very obvious. The horse will be back in training a lost faster with laser castration because of the minimal swelling and no open, draining wound to worry about. While the horse is under general anesthesia a CO2 laser is used to remove the testicles. Due to the closed incision the procedure is aseptic which means it is free of pathogens. The laser also reduces the chance of hemorrhaging and swelling as a result of the cauterizing effect. For horses that need to get back in training quickly laser castration is not only effective but also cost-effective. In addition to this there are many other surgeries that can be done with laser while a horse is standing which means this eliminates the need for general anesthesia and large incisions. Laser surgery is also a good idea for tumors. Either type of laser can be used to remove tumors depending on their location. The CO2 laser can ablate or evaporate tissue on surface tumors. For large tumors inside the horse they can be reached endoscopically and may need more than one treatment with the Nd:YAG laser since the debris needs to be allowed to fall away. Read the next horse health tips article on Controlling Horse Flies. Tack needs to be maintained religiously. Synthetic tack can be hosed down or washed in the washing machine. It's lighter in weight, easy to care for, and less expensive than leather. Leather, needs much more care. Inspect it every time you clean it. Wash it every time you use it, and then oil the leather parts a few times a year. Browse some different types and styles of synthetic and leather horse tack available online. Have your horse products or services exposed to over 27,000 of our monthly visitors. Copyright (c) 2011. American Horse Rider & Horses and Horse Information. All rights reserved.